Amerigo Vespucci was an Italian explorer who went on several expeditions to South America. Having discovered present day Brazil, he recognised South America as being a new continent rather than the eastern extremities of Asia as had previously been thought. Consequently he named it the ‘New World’. This page details facts about Amerigo Vespucci's life and the events that shaped his history. Amerigo Vespucci the Explorer - Fun Facts for Kids ! 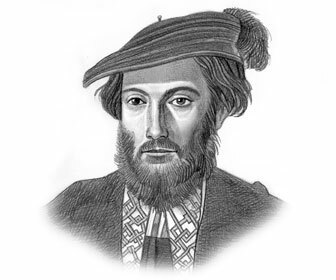 Amerigo Vespucci Fact 1: Amerigo Vespucci was born in Florence, Italy on 9th March 1454. His father, Nastagio Vespucci, was a notary (Lawyer), and his elder brothers attended the University of Pisa. Amerigo Vespucci Fact 2: Amerigo Vespucci became a clerk in the Medici Bank and went on to gain the favour of the head of the business, Lorenzo di Pierfrancesco de' Medici. Amerigo Vespucci Fact 3: In 1492, Amerigo Vespucci was sent to the Cadiz branch to look into the Managers’ dealings as they were considered suspicious. By 1495, Amerigo Vespucci was working in Seville with Gianotto Berardi, another of Medici’s agents, who supplied ships with provisions. Some of the ships supplied were for a voyage of Christopher Columbus. Soon after, Vespucci himself took part in some voyages to the New World. Some of the voyages, which Amerigo Vespucci is thought to have made, are the subject of controversy. There are two sets of documents relating to his voyages. One set, which is now thought to have been fabricated, mentions four voyages. The other set, which only mentions two voyages, is formed of three private letters to the Medici’s and is thought to be genuine. All attempts to reconcile the contents of these two sets of documents have failed. Amerigo Vespucci Fact 6: One of the disputed voyages set sail from Cadiz on 10th May 1497, and sailed to Central America via the West Indies, before returning to Cadiz in October 1498. Amerigo Vespucci Fact 7: In May 1499, Amerigo Vespucci sailed as Navigator on a Spanish Expedition commanded by Alonso de Ojeda. After reaching Guyana, he left Ojeda and headed south discovering the mouth of the Amazon River and continuing to latitude 6˚S before returning to Spain via Trinidad, the Orinoco River and Hispaniola. Amerigo Vespucci Fact 8: On the 13th May 1501, Amerigo Vespucci sailed from Lisbon on a Portuguese expedition. He sailed to the Cape Verde islands before heading for Brazil. When he arrived at the coast of Brazil, Amerigo Vespucci continued south to Rio de Janeiro’s bay. There is doubt over the remainder of the voyage, however it’s believed that he continued on past the Rio de la Plata to Patagonia (in modern day Argentina). On 22nd July 1502, he anchored back in Lisbon, although the return route remains a mystery. Amerigo Vespucci Fact 9: It was this 1501-1502 voyage that convinced Amerigo Vespucci that these lands weren’t the eastern extremes of Asia, as had previously been thought, but a New World. Amerigo Vespucci Fact 10: According to the disputed set of documents, Amerigo Vespucci undertook a fourth voyage. This was said to have taken place between 1503 and 1504 for Portugal. Again, it was said to have been along the eastern coast of Brazil. Whilst Portuguese documents confirm such a voyage, there is no evidence to support Vespucci being part of it. Amerigo Vespucci Fact 11: In 1505, Amerigo Vespucci was employed by the Casa de Contratacion de las Indias (Commercial House for the Indies). He was appointed Chief Navigator in 1508, a position he held until his death. Amerigo Vespucci Fact 12: In 1507, Martin Waldseemuler, a German cartographer, applied the name ‘America’ to South America for the first time. The name was derived from ‘Americus’ the Latin version of Vespucci's first name, Amerigo. 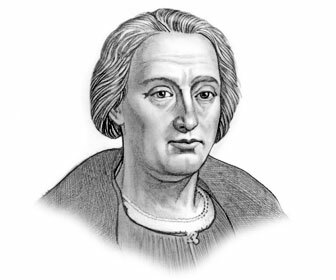 Amerigo Vespucci Fact 13: Amerigo Vespucci died on 22nd February 1512. The cause of his death is unknown. Amerigo Vespucci the Explorer (1454 - 1512) Fun Facts Info for Kids !